How Can You Improve Comfort with CPAP Mask Therapy? 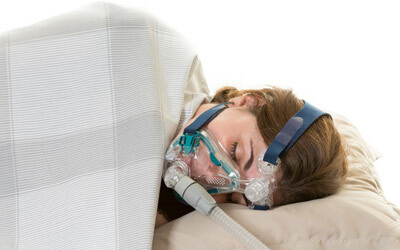 Home > CPAP Machine Toronto > How Can You Improve Comfort with CPAP Mask Therapy? One of the concerns many people have with CPAP masks is comfort. The idea of sleeping with a mask covering part of your face and a machine making noise nearby may make you feel uneasy. If you suffer from sleep apnea and want to find a good treatment, however, CPAP therapy is definitely worth checking into. This is the most common treatment for a reason: it’s effective. There are ways to get used to the mask. In fact, you can even make the experience comfortable. Make sure you get a mask that fits. While a tight mask will be uncomfortable, a loose one will as well. If it doesn’t fit nice and smug, it won’t create a proper seal and you won’t get the supply of air pressure that you need for a good night’s sleep. Some CPAP users report waking up with a dry, irritated nose or throat. The problem is intensified when the heater or air conditioner is running. When there isn’t a lot of moisture in the air, you’ll need to get it through CPAP therapy. The warm, moist air provided by the humidifier can not only improve your comfort level, it can improve the overall effectiveness of the treatment. Talk to your doctor about ordering a machine with the humidifier function. While CPAP machine manufacturers are working on developing good, durable straps, not every patient finds them to be comfortable. They might even leave red marks on your face. Luckily, there are solutions. There is smooth, soft material designed to fit on the inside of mask straps. This fabric is made out of a breathable fleece material and features Velcro connectors. You can also try out masks with different straps to see if any are less uncomfortable. On some masks, the straps are adjustable. Still, you must make sure that it fits securely onto your face in order to get the right amount of quality air. Soreness is a common problem for many users. The bridge of the nose in particular is an area that experiences discomfort with the CPAP mask. There are a few different options to dealing with soreness. You could just wait it out, just as you would when trying to break into a new pair of shoes, or you could try a different mask. There are also nasal pads or pillows available that provide a barrier between the nose and the mask. If you just don’t like the idea of wearing a mask, you could try wearing nasal pillows as an alternative. If you don’t want to wear a full mask, you can obtain chin straps that can be used with nasal pillows. The straps are designed to fit at the crown of your head and under your chin to keep your mouth shut while you sleep. This is a helpful feature for you to consider if you tend to sleep with your mouth open. It’s important to give your CPAP mask time to work. Sometimes, all it takes is a bit of patience. Try wearing it around the house during the day until you get used to it.